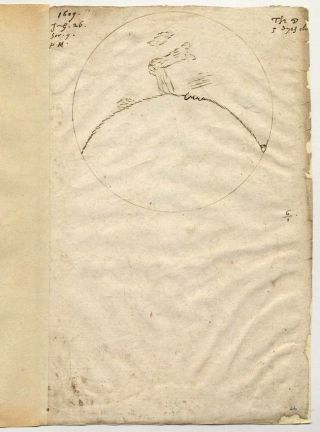 The first drawing of the Moon through a telescope, dated July 26, 1609, by Thomas Harriot. This crude but historic sketch roughly delineates the terminator, the line that marks the boundary between day and night on the lunar surface. The original image is a little more than 15 cm across. The dark patches correspond to Mare Crisium (at the top), Mare Tranquilitatis and Mare Foecunditatis. Galileo Galilei is often credited with being the first person to look through a telescope and make drawings of the celestial objects he observed. While the Italian indeed was a pioneer in this realm, he was not the first. Englishman Thomas Harriot made the first drawing of the moon after looking through a telescope several months before Galileo, in July 1609. Historian Allan Chapman of the University of Oxford details that 400-year-old breakthrough in astronomy in the February 2009 edition of Astronomy and Geophysics, a journal of the Royal Astronomical Society. Chapman explains how Harriot preceded Galileo and went on to make other maps of the moon's surface that would not be bettered for decades. He then became a mathematical teacher and companion to the explorer Sir Walter Raleigh. In the early 1590s Raleigh fell from royal favor and was imprisoned in the Tower of London. Harriot was passed to the patronage of Henry Percy, the Ninth Earl of Northumberland who was himself imprisoned as one of the Gunpowder Plotters in 1605 but continued to support Harriot in his residence at Sion (now Syon) Park, in what is now west London. Harriot became a leading force in mathematics, Chapman explains, working on algebraic theory and corresponding with scientists across Europe. The earliest telescopes of the kind used by Harriot (and Galileo) had a narrow field of view, meaning that only a small portion of the moon could be seen at any one time and making this work all the more impressive. No better maps would be published for several decades. Chapman attributes this to his comfortable position as a "well-maintained philosopher to a great and wealthy nobleman" with a generous salary, said to be "several times the level of the Warden of Wadham College, Oxford." Harriot had comfortable housing and a specially provided observing chamber on top of Sion House, all of which contrasted with Galileo's financial pressures. Galileo, interestingly, was unable to buy a telescope. So he figured out the optics of it and built his own. He also examined the moon, and then found that the Milky Way was composed of individual stars. Galileo also discovered four moons around Jupiter and spent much time observing and drawing sunspots. "As an astrophysicist of the 21st century, I can only look back and marvel at the work of 17th century astronomers like Thomas Harriot," Fabian said. "The world is right to celebrate Galileo in the International Year of Astronomy – but Harriot shouldn't be forgotten!"